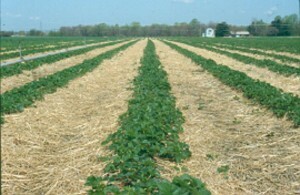 Weed Control in matted row strawberries relies heavily on controlling weeds with preemergence herbicides and postemergence herbicides. Weeds are effectively controlled before they germinate or as small seedling growing vegetatively (before flowering). Late winter or early spring after the soil has thawed and winter annual broadleaf weeds have broken dormancy, but before strawberries begin to grow, is a key time for herbicide application. Apply 2,4-D amine, Formula 40 or other labeled 2,4-D formulations, in late winter or early spring to control emerged winter annual broadleaf weeds. Excellent weed control can be achieved. Add Chateau to provide residual annual broadleaf weed control. Use 1 quart of Formula 40 per acre and 3 dry ounces of Chateau after the soil in no longer frozen, but before the strawberries break dormancy and begin to grow. Chateau can be used once in each calendar year. If Chateau was used in the late fall of 2013, Chateau can be reapplied in the March or early April of 2014, but not used again in the 2014 calendar year. Some injury to early growth is possible, but the crop will “out-grow” any injury. Do NOT apply after the crop has broken dormancy and begun to grow or more severe and lasting injury may result. Strawberry growers should note that THE SINBAR LABEL HAS BEEN REVISED. The PreHarvest Interval (PHI) for Sinbar use in strawberries is now 110 days. This effectively eliminates late winter and early spring applications of Sinbar to strawberries before harvest. 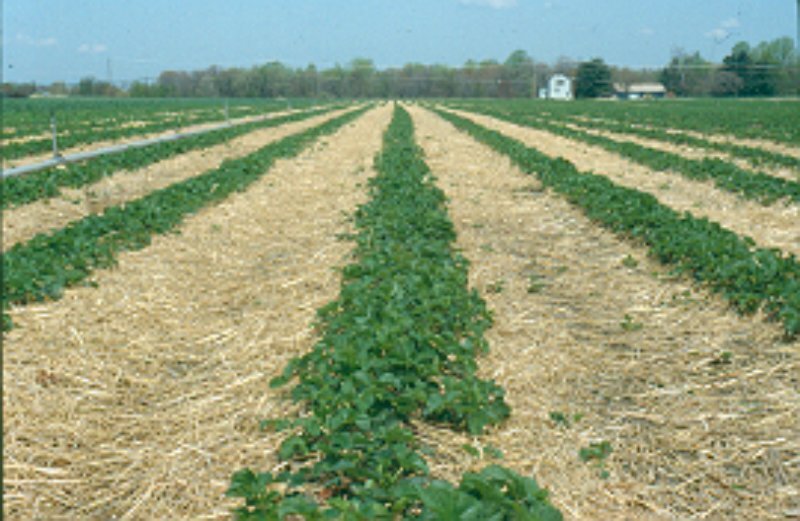 A typical strawberry field grown using the matted row system begins to bloom about May 1st and harvest begins in late May or early June. The cut-off date for the 110 day PHI would be sometime in February and has already past.